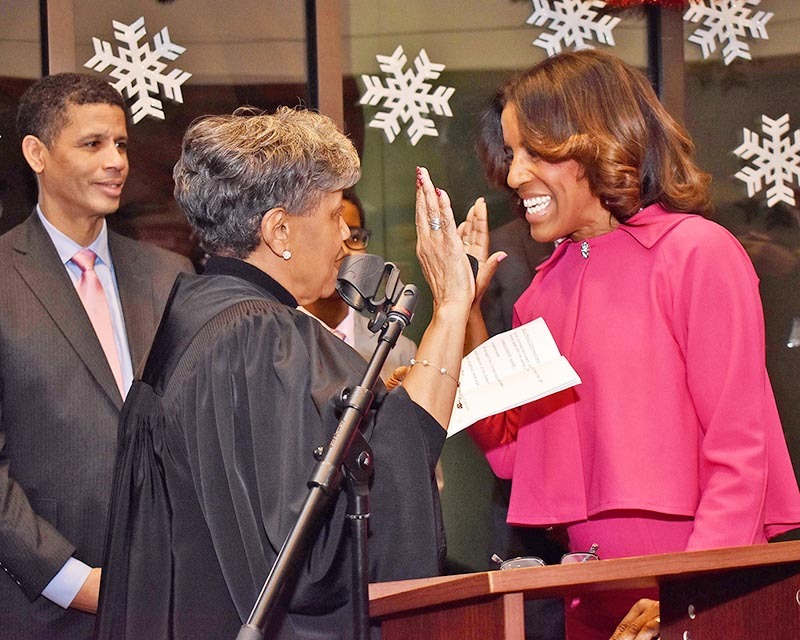 On her first day as a Cook County Commissioner, Donna Miller said she is committed to being an effective advocate for the South Suburbs. Miller, of Lynwood, started Monday with a 10:30 a.m. county board meeting in Chicago that featured a group swearing-in ceremony. She is one of seven newly elected commissioners on the 17-member county board. By 5:30 p.m., she was at Prairie State College in Chicago Heights, where she thanked supporters at a reception in her honor. As she sat for an interview with the H-F Chronicle, well-wishers smiled at Miller, shook her hand and offered her hugs. The reception also included her second swearing-in of the day. The 6th District, located entirely in the South and Southwest Suburbs, is shaped like a backward “J” and contains portions of Bloom, Bremen, Rich, Thornton, Orland, Palos, Lyons and Worth townships. It borders Indiana on the east and Will County on the south and west. Homewood is located in the district. So is a small portion of Flossmoor, although most of that village is located in the 5th District to the west. Miller believes she represents “the most interesting district in Cook County.” The highly diverse district has about 30 cities and villages with a range of racial characteristics and socioeconomic levels. On her first day in office, Miller was named to 13 county board committees, several of which reflect her priorities. She is vice chairman of two committees, one of which focuses on workforce development. Miller’s other committee assignments will give her a chance to examine business development and criminal justice. She is a member of the county board’s audit committee. During her election campaign, Miller stressed the need for greater county health care services in the 6th District, and the South Suburbs as a whole. With 25 years as a health care professional, Miller wants to expand medical services in the area. The county board addresses health care issues as a committee of the whole and Miller plans to work for greater services in the Southland. She points to studies that show that 25,000 residents from the 6th District formerly used health care services at Oak Forest Hospital, which closed a few years ago. The 6th District, with numerous low-income residents, does not have a county clinic. Miller said she plans to work toward getting a clinic in the district. While running for election, Miller also stressed the inequities of the property tax burden facing south suburban residents. Property tax bills are unfairly high in the South Suburbs and Miller pledged to seek relief on the county level. Miller said she has met a number of times with Fritz Kaegi, the newly elected Cook County assessor, and that he is committed to taking steps that will make property taxes more equitable in the south suburban region. Kaegi is familiar with property tax problems in the region and wants a system that is more fair for residents. The 6th District is filled with people “who really like living here,” Miller said. Miller encourages residents of the 6th District to attend county board meetings and to contact her through her website, www.godonnago.com. South Suburban Hospital’s first baby of 2019 arrives at 1:04 a.m.